We have lived in apartments until we bought our house about two years ago and I finally got what I had dreamed of for years – a workshop! I decided to get some proper woodworking tools but with the limited space available a large table saw or cabinet saw was out of the question. A good quality plunge-cut saw was therefore the natural choice to cut those large sheets of plywood. I quickly got my mind set on the Mafell MT 55 cc after reading several reviews – it seemed to tick all the boxes above and after inspecting it at my local hardware shop I had made up my mind. With this said I have no way of justifying the price tag when taking into consideration how often I actually use it and that it’s only for hobby use but nothing beats the feeling of using quality tools so I went for it. There is no doubt that Festool used to be king of the hill when it comes to plunge-cut saws and the Festool TS 55 R was one of the main alternatives that I considered. Their saws and the tons of accessories they offer are very appealing but everywhere I turned the Mafell MT 55 cc was just getting better reviews. Predominantly because of the build quality, better guide rails, the quick change of saw blades and the scoring function. An interesting thread on the Mafell vs Festool can be found on the Festool Owners Group where even the Festool fanboys mostly favor the Mafell. I have had the saw for around 12 months now and I am in no way disappointed. Everything that I have used it for has been absolutely perfect. Making adjustments is so easy, the motor is super strong and have never broken a sweat. Precision is perfect and I am very impressed with the dust collection. The blade that it comes with has been perfectly fine for everything that I use it for. I have only ever tested the scoring function for the fun of it – in normal use I have never needed it because the saw does such an outstanding job without it. I bought the saw with two 1.6 meter guide rails. This is a highly recommended setup. For cross-cuts of 4×8 sheets (1220×2440 mm) I use one guide rail and when doing the long cuts I combine them to get a 3.2 meter rail. The only drawback I can really point to besides the somewhat steep price tag that it comes with is that if you have already bought into the Festool line-up with tons of accessories it may not be that the advantages of the Mafell saw over the Festool equivalent outweighs the benefits of having a Festool saw that works with all the other Festool accessories. But if you want the best stand-alone plunge-cut saw on the market I would strongly argue that Mafell MT 55 cc is that saw. 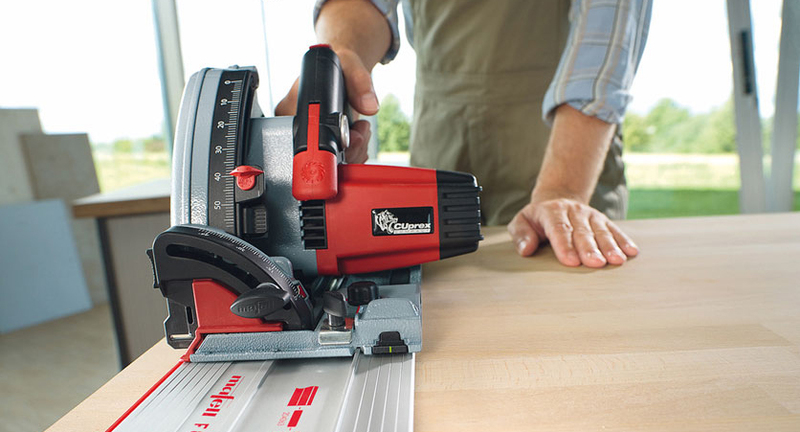 There is no doubt in my mind that the Mafell MT 55 cc is the king of the plunge-cut saws. Everything I have put it through it has handled flawlessly and even though I had pretty high expectations before buying it it has not disappointed one single time. So I would not hesitate for a second to recommend it. It does come with a high price tag but I would say that here you get what you pay for – it is worth every penny and it is just that good! The Bosch PBD 40 710W bench drill comes with a ton of unique features as shown in the promo video above. The clamp and fence system is super easy to use, the LCD with RPM and depth of cut is miles better than anything I’ve seen before. The cross-hair laser also works well. I use it all the time but if something has to be super accurate I always find myself predrilling to make sure that all is perfect. I have now had the Bosch PBD 40 for around two years and as an amateur woodworker and DIY hobbyist I have to say that it has worked brilliantly for all I have used it for. The motor seems very capable and used with a 35mm Festool forstner style drill bit it it was like a knife through butter with no hint of labouring under the load. The adjustable speed control is also one of the main benefits of this machine – no mucking about with belts – just turn the dial and you’re done. The combination of the clamp and fence combined with the LED light and the cross-hair laser makes everything very swift and efficient. The LCD display with the depth of cut shown also supports this experience and the Bosch is just overall well thought through. So far so good… Now what about design faults? I have read reviews where some complain about accuracy and as you can read below from the list of cons I could list a few minor things that could have been made my experience of the Bosch PBD 40 bench drill better. But considering the cost and all what it does well it is negligible. 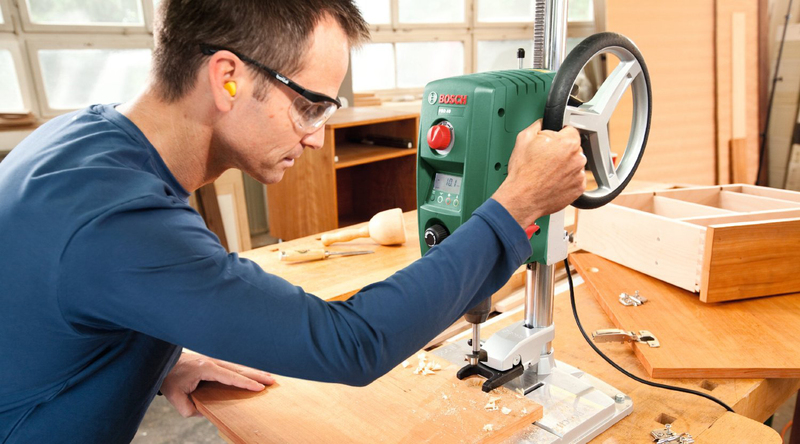 For the hobbyist with a small workshop I would consider the Bosch PBD 40 drill bench the perfect choice. Sure there are classic bench drills that can be bought second hand that would be great alternatives but the Bosch still has some tricks up its sleeve with the bulk of innovative features it packs. So there it is I’m giving this a solid 4 stars because I think it’s the near perfect piece of kit for the person it is clearly designed for – the DIY woodworker and I would have no hesitation in recommending the Bosch PBD 40 710W bench drill. Team Durango DEX8 – Fastet kit build ever! 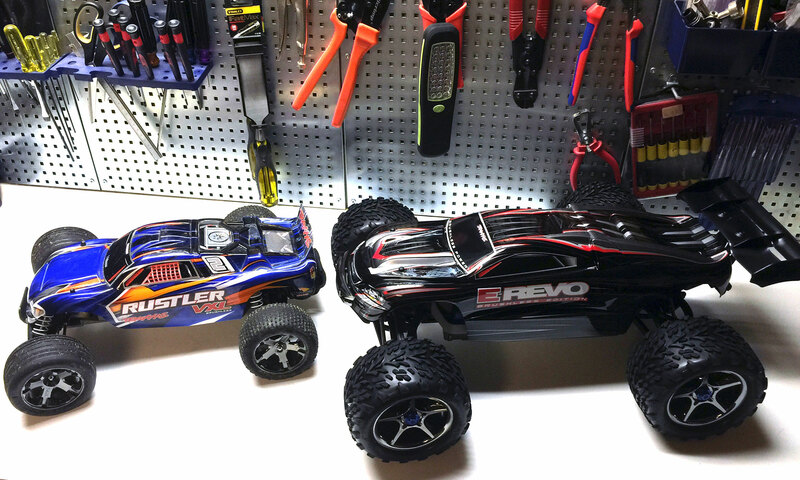 Traxxas E-Revo Brushless – The best all-round RC car money can buy! Austin Weingart on Traxxas E-Revo Brushless – The best all-round RC car money can buy! deguno on Traxxas E-Revo Brushless – The best all-round RC car money can buy! Gerry on Traxxas E-Revo Brushless – The best all-round RC car money can buy!